Take full advantage of your Engineers & Geoscientists New Brunswick membership with privileged access to the TD Insurance Meloche Monnex program, which provides savings through lower preferred insurance rates. You’ll also enjoy the outstanding customer service you deserve, with knowledgeable representatives who are always ready to help. A recent study conducted by TD showed that, on average, professionals who have home and auto insurance with us save $400. We have been serving thousands of professional like you for 65 years. We would be pleased to count you among our many satisfied customers. Garrett Agencies is the authorized advisor and representative for the Engineers Canada life and health insurance plans, providing professional advice and service to APEGNB members at no additional cost. Chosen for its objective advice, expertise, and product knowledge, the agency will assist you in developing an appropriate risk management strategy for your life and health insurance needs today and into the future. A new Professional Retiree Health and Dental Insurance Plan, sponsored by Engineers Canada and underwritten by Manulife, is available to all eligible Engineers Canada members in Canada. ENCON Group Inc. administers professional liability insurance programs for Canadian engineers under the direction of the Association of Consulting Engineers of Canada and the Canadian Council of Professional Engineers. The national associations’ endorsement of the ENCON Program dates back to 1970 and has been the driving force which has initiated many changes to the program over the years. The ENCON program offers Canadian engineers competitive coverage, pricing, and access through independent insurance agents and brokers across Canada. The additional features which are provided by the program include loss prevention services, contract review services, prompt claims handling directed through the head office in Ottawa and conducted by regional branches of adjusters and legal people. The managers of the program at ENCON are responsible to the national associations in terms of reporting with respect to rate levels, coverage requirements, and other issues relating to the evolution of the program required by Canadian consultants both here in Canada and overseas. Engineering professionals have counted on Manulife’s Term Life and Accident Insurance program for over 60 years. For more information about the Engineers Canada-sponsored insurance programs, call 1.877.598.2273 to get a free quote or to apply online please visit the Manulife website. Engineers, geoscientists, students and their families have exclusive access to the program. Lower fees can help your money grow faster and last longer in retirement. Extensive investment choices through group RRSP, non-registered savings plan, TFSA and retirement income products. Free personal investment guidance and support. Program has been well-established for almost 40 years. Change your asset mix anytime without penalty. Enhanced interest rates on guaranteed investment accounts. No transfer or administration fees. 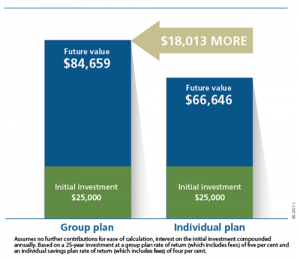 Compare for yourself – see the difference lower fees could make on your retirement savings and income. The Great-West Life Assurance Company, key design and marks displayed followed by the TM symbol at first-time of use are trademarks of The Great-West Life Assurance Company (Great-West Life), used under licence by London Life Insurance Company (London Life) for the promotion and marketing of insurance products. London Life is a subsidiary of Great-West Life. Group retirement and savings products described herein are issued by London Life. The Secondary Professional Liability Insurance Program assists the engineering and geoscience licensing bodies in their mandate to uphold and protect the environment and the safety and interests of the public. It enhances self-regulation for both the engineering regulators and individual engineers, and enables engineers and geoscientists to seek advice in whistleblower situations. All individual engineers and geoscientists in good standing with a participating provincial or territorial regulator are insured. They are also covered as mentors helping other less-experienced individuals develop specific skills and knowledge that will enhance professional and personal growth. S bill will be covered in case of accident or illness. It’s a simple effective way to take the financial stress away during those difficult ties. Check out our comprehensive plans, which take care of your veterinary costs for accidents, illnesses, and even dental care. Call PetSecure at 1.800.268.1169 or visit our website for details. Engineers Canada has partnered with UPS to offer a broad range of services for the transportation of packages and freight for engineering professionals. Visit the Engineers Canada website for more information. Get low rates and unlimited mileage on business and leisure travel. Visit the Engineers Canada website for more information.